The other day it was really nice out, a good day to get out and walk. As I was walking along the road I heard the soft tapping of a woodpecker. A few years ago at the Detroit Lakes Birding Festival when we were looking for Black-backed Woodpeckers, the leader said to listen for soft tapping. I have remembered that and have found several of the three-toed Woodpeckers using this tip. After a little bit of searching, I found the bird on a downed log. She then flew up to another tree and I could see it was a female. The females lacks the yellow cap. 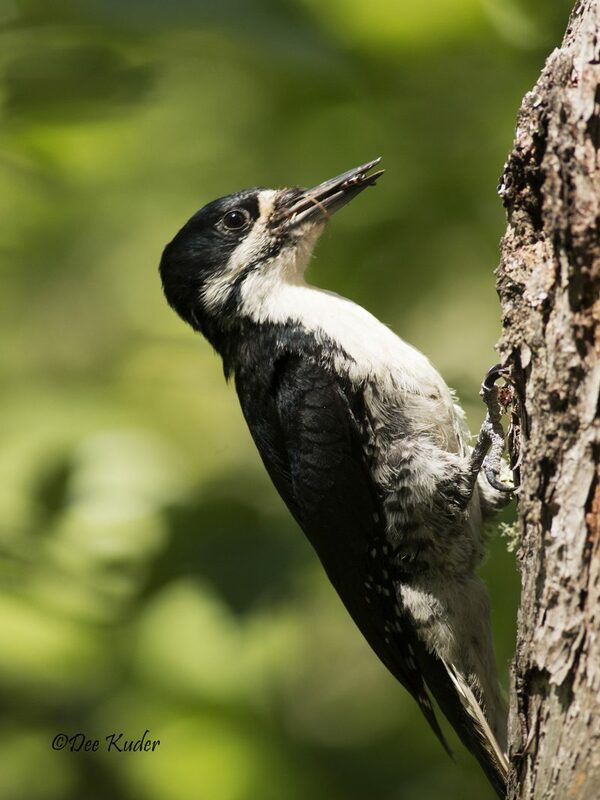 In Minnesota there are two species of Woodpecker that have 3 toes, as compared to other Woodpeckers who have 4 toes. Besides the Black-backed, there is the American Three-toed Woodpecker. The American 3-toed is not as common as the Black-backed. In the old bird books the Black-backed is called the Arctic Three-toed Woodpecker. I almost like that name better.